For KATSU, getting him name in a place is getting his name in a place, regardless of if that place is the wall of a building or the homepage of a website. That makes perfect sense if you see digital space as essentially the same as physical space. An example of letterbombing on Facebook. Screenshot courtesy of Jeff Greenspan. But what if you want to graffiti a website, but you don’t have the hacking skills or a willingness to break the law? Letterbombing is a very fun and legal way to insert unexpected and difficult to filter out digital graffiti onto Facebook pages and walls. The technique is simple. You get a bunch of people together and everyone simultaneously posts something random on a person’s Facebook wall or on a Facebook fan page. Then, with all those people’s posts stacked one on top of the next on the wall of the intended target, the letterbombers change their profile pictures to letters of the alphabet such that the group spells out a message through their profile pictures. The result is a message that’s plainly visible to any human looking at the targeted page, but completely invisible to anyone (or any piece of software) monitoring the page for negative comments by only looking at the contents of posts. Letterbombing is a form of invasive viral art that pops up quite blatantly but with no warning of what to expect or that users should be expecting anything at all, giving viewers a surprise similar to seeing an unexpected piece of graffiti on a wall. It’s graffiti for Facebook. The technique was developed by Jeff Greenspan, Chris Baker, and Daniel Adrain and tested out on the Facebook pages of Glenn Beck and Sarah Palin in October 2010, a couple of weeks before Jon Stewart and Stephen Colbert’s Rally to Restore Sanity and/or Fear. 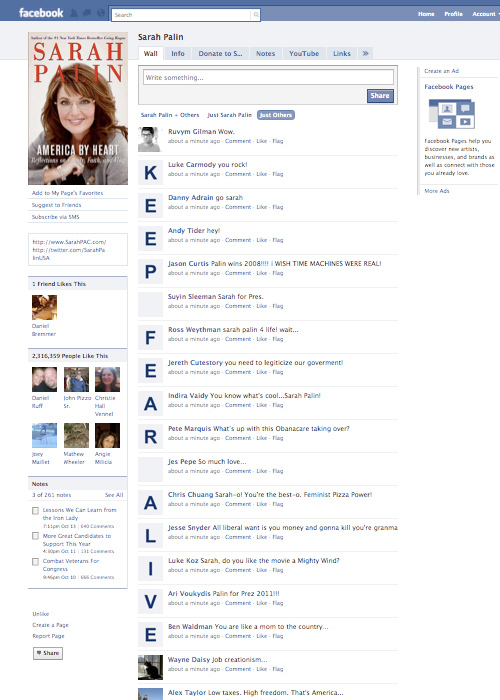 They were able to spell out Colbert’s slogan for the rally, “KEEP FEAR ALIVE,” on Beck and Palin’s Facebook fan pages, exposing the message to each page’s visitors. Although both of those pages probably have moderators to look out for anyone posting messages like “KEEP FEAR ALIVE,” letterbombing the pages allowed the message to stay up. People visited those pages expecting to see the latest news about their favorite right-wingers, but instead they were confronted with some completed unexpected invasive viral art. Despite the results essentially being website defacement, letterbombers don’t break any rules or laws. They just hack Facebook (I mean hack in the sense of using something for an unintended purpose), using profile pictures in a nontraditional way to get their messages past traditional filters. Maybe letterbombing doesn’t have the edge of traditional website defacement relying on black hat hacking or graffiti writers running around in the middle of the night, but the result isn’t so different. Due to an updated layout on Facebook, letterbombing doesn’t work nearly as well as it did in 2010, but it can still be implemented in the comments of a post.